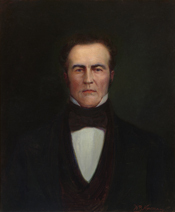 BELL, John, a Representative and a Senator from Tennessee; born near Nashville, Tenn., February 18, 1796; graduated from Cumberland College in 1814; studied law; admitted to the bar in 1816 and commenced practice in Franklin, Tenn.; member, State senate 1817; declined to be a candidate for reelection and moved to Nashville; elected to the Twentieth, and to the six succeeding Congresses (March 4, 1827-March 3, 1841); Speaker of the House of Representatives (Twenty-third Congress); chairman, Committee on Indian Affairs (Twenty-first through Twenty-sixth Congresses, except for Twenty-third), Committee on Judiciary (Twenty-second and Twenty-third Congresses); appointed by President William Henry Harrison as Secretary of War March 5, 1841, and served until September 12, 1841, when he resigned; member, State house of representatives in 1847; elected as a Whig to the United States Senate in 1847; reelected in 1853, and served from November 22, 1847, to March 3, 1859; unsuccessful candidate in 1860 for President of the United States on the Constitutional Union ticket; investor in ironworks at Cumberland Furnace in Chattanooga, Tenn.; died at his home on the banks of the Cumberland River, near Cumberland Furnace, September 10, 1869; interment in Mount Olivet Cemetery, near Nashville, Tenn. Dictionary of American Biography; Parks, Joseph H. John Bell Of Tennessee. Baton Rouge: Louisiana State University Press, 1950.